I would like to share my thanksgiving to all of you, our partners in ministry. Secondly, I thank God for our young people. If you remember in my previous letter I mentioned about YOUTH SEMI-RETREAT happened after our VBS. It was a successful one. The purpose of the retreat was to prepare them spiritually and emotionally as they are going back to their studies. There were no photos taken during course of the retreat for cellphones or any forms of gadgets were not allowed and were in the hands of Ptr. Richard (youth pastor) for 2 days. I was astonished by their reaction that they realized they can live without those things. Truly, young generations are internet dependent. In the 2 day retreat they learned and enjoyed the life in the presence of God. After the retreat, the youth went for BONDING moments. 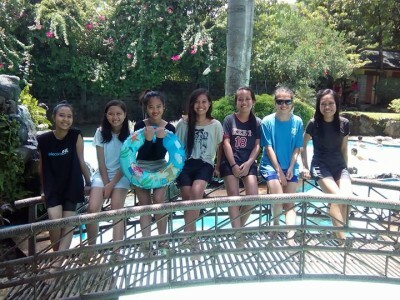 Last Sunday, June 12, we went to a resort outside Quezon City as a sort of refresh and recreation after experiencing whole week of VBS and 2 days retreat. Sadly, some of the youth were not able to join us for the R n’ R.
Our summer was meaningful and successful in terms of ministry, to God be the glory! And thank you for all your prayers. *[Aimee Guan – a grade 10 student who has ovarian cancer. Reported in March ‘16]. Copyright © 2010 ACMissioNZ. All rights reserved.